So, the castle down the street from my childhood home is for sale. No, I don’t mean a really nice house. The Versailles Castle as it stands now. The road on the top of the picture would be Versailles Road, the road between Lexington and Versailles… follow that road to the right, go about a quarter of a mile, turn left and go all the way to the end of the street? That’s where I grew up. Let me explain, it’s a real castle. We’re talking about a huge multi-turreted-building-in-the-middle-with-a-courtyard-between-it-and-four-fortress-walls castle. 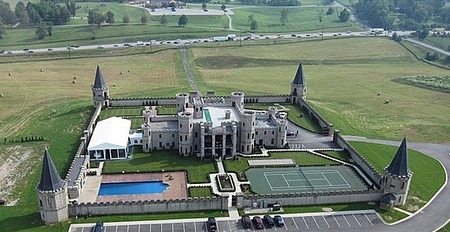 This palatial estate on more than 252 acres in the middle of horse country in Central Kentucky is roughly one mile to the left and up the street from my mom’s house – which we all know is my first castle. I grew up next to this thing. It has literally been a part of my life since I was three. I watched it being built from the moment ground broke, until it sat dormant. Ever since I was in elementary school, the Castle in Versailles, Ky. has been a mystery, a landmark, a laughing stock and a wonder. When I was in second grade, my friend, Jeff, and I sat on the playground of Pisgah Elementary School watching the castle and speculating about it. To be honest, we would sit inside of a two-foot tall concrete tube left on the playground during construction, and we would periodically poke our heads above the side like little gerbils to look at it before burrowing back into the tube to furiously discuss in our 7-year-old furor over why it was there. 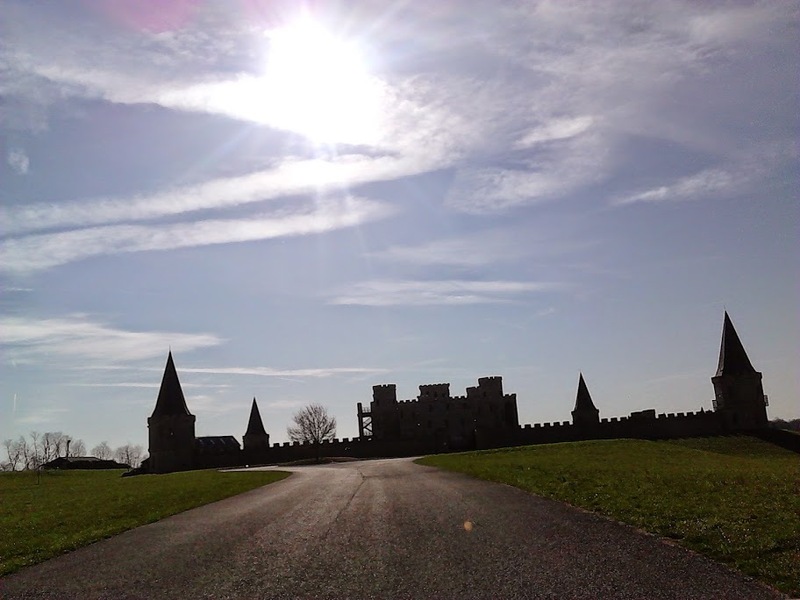 I mean… uhm… it was a castle… in the middle of nowhere Kentucky… and there weren’t any horses or playgrounds anywhere on it! Our 7-year-old minds boggled. Granted it was in VERSAILLES, but in Kentucky (as in Ohio and Indiana) that’s pronounced Ver-sales, not Ver-si like they say in France. At the time, we ALL thought it was a gift from the Six Million Dollar Man to one of Charlie’s Angels. 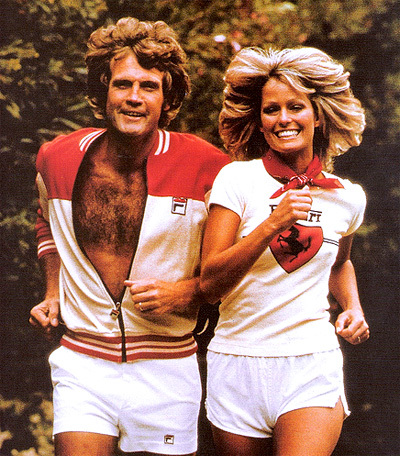 Because Lee Majors was then was married to Farrah Fawcett. And he had a horse farm in Woodford County, or so we all thought. And this was when every boy in school had a Farrah bathing suit poster on their wall, and the Six Million Dollar Man lunchbox was THE lunchbox to have. We thought we were looking at a wedding present and that soon we’d be watching little Six Million Dollar Angels during recess. Maybe if he had given her the castle, she might never have left him and gone kinda nutso. Or at least had a little more space to do it in private. Can you imagine castle walls painted with a Farrah brush? Boys everywhere would have been checking in to see bathing suit marks. Not that they could afford it now. Started in 1968 by Rex and Caroline Bogaert Martin, the castle was inspired by a trip to Europe. Cause doesn’t everyone come home from vacation and think “Hmmm. I’d like to have a little piece of medieval history right here that I can live in”? But construction stopped when the two divorced in 1975. For more than a quarter of a century until Rex Martin died, the castle remained vacant. In 2003, the castle was purchased by a Miami tax lawyer who had plans to turn it into a bed and breakfast. Seriously… who eats beans for breakfast? I mean, come on! Where’s the oranges and muffins? And don’t even get me started on the tomatoes and mushrooms. 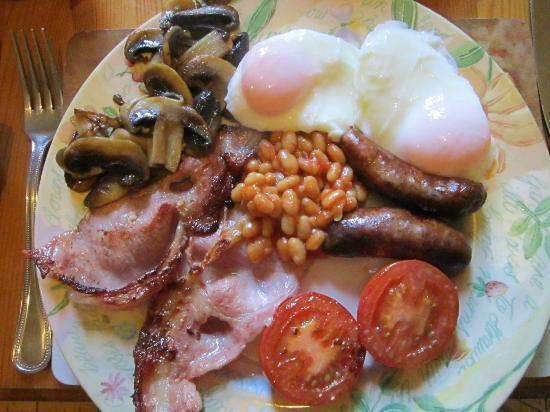 Now, I’ve stayed in bed and breakfasts in England…. And I have a hard time imagining that anyone staying at the castle would get scrambled eggs, bacon, tomato slices and baked beans for breakfast. Or have to share a bathroom. Or find themselves curled up to sleep under chintz sheets that smelled oddly like your 80-year-old grandmother and lavender. When an unfortunate fire during the initial stages of construction in 2004 (uhm… Jewish lightning anyone?) destroyed the building, construction began again. In just a few short years, it was finished and opened to the public. Well, at least the public that could afford the $750 a night it cost to stay in a turret room. Currently, the 50-room castle includes a full library, a great hall, chandliers, marble floors, a game room, and a dining room that seats 40. The grounds – on the inside of the fortress walls, includes manicured gardens, a tennis court, a pool. And let’s not even get started on the rooms that look like something out of Downton Abbey on steroids. Now guest rooms go for between $325 for a state room and $1,250 for a turret room. That’s inflation for ya. I mean, what is the world coming to when a turret room in a castle in the middle of nowhere increases in price by nearly 70% in just a few short decades and a complete renovation? There are signs around the building now that say “Guests only!” This is a place that everyone who has driven thru Versailles – and I’m sure there have been dozens through the years – would stop to take a picture of. Now they want to close it off only to the one percent? The view, almost, from where Pisgah used to sit. I’d always dreamed of going inside. It’ll only cost me a cool $30 million. That comes down to renting out all the turret rooms 6,000 times to break even. I think I’ll take the view from the concrete tube.